Film properties (props) include set dressing, costumes, and items used by the actors in the films. Props are used to establish place, time, culture – the setting of the film. Every film, no matter how short or seemingly simple, uses hundreds of props. In spite of their numbers, screen-used props are difficult to find and even more difficult to authenticate, for several reasons. Props are reused. Props are often rented from commercial prop houses or checked out from central studio prop departments and returned at the end of filming, only to be rented for or checked out to other films. Sometimes the parts of props are cannibalized to make new props. Props are taken as souvenirs by cast and crew. Cast and crew are usually offered first choice of props that are going to be sold. These props almost never have documentation of authenticity. Props are often disposed of on location, thus they are scattered all over the world. The props from Xena: Warrior Princess, for example, were sold at auction in New Zealand; those from Lost were auctioned in Hawaii; the wreck and many of the sets of Titanic (1997 version) were abandoned where the movie was filmed in Mexico. Props are generally not treated well. They are thrown, smashed, and used in combat. They are destroyed in automobile, plane, and train accidents. They are blown up, burned up, and sunk. They are put through earthquakes, hurricanes, sand and snow storms. They are artificially aged, faded, dirtied, dented, bent, and mangled. The price of a prop is determined by many factors, probably the least of which is the cost of a similar item that has not been used in a film. Among the factors affecting the cost of a prop are the popularity of the film and its actors, the uniqueness of the prop, the extent to which the prop was used in the film, and the scarcity of props from the film or actor. The most expensive props are those that can be demonstrated to have been used by one or more of the leading actors in a film – so-called “hero” props. The most expensive hero props are those used by the most admired actors in the most popular movies. In June, 2011, Marilyn Monroe’s iconic “subway dress” from The Seven Year Itch sold at auction in Beverly Hills for $5.6 million!! Hero props are almost never one-of-a-kind. A film cannot be jeopardized by having only one of a major costume or prop. 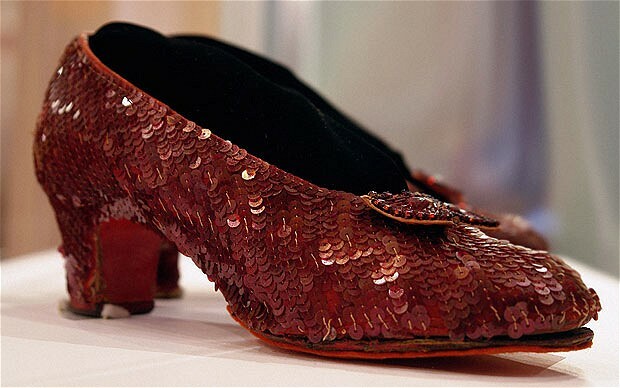 There are four known remaining pairs (of an estimated seven originally) of Dorothy’s ruby slippers from The Wizard of Oz. One pair is in the Smithsonian, and one pair was bought this year for the Academy Museum of Motion Pictures by a consortium of Hollywood luminaries (Leonardo Di Caprio and Stephen Spielberg, among them) for an estimated $2-3 million (the price was not revealed).